Back to school has already approached for some of you. My son goes back in a few short days. I sure am going to miss seeing his sweet face all day. I’ve jumped on the organization printable craze recently and decided it would be fun to share them with all of you. This is a student planner I have put together for you all that you can print and bind on your own. The calendar is undated so you can come back to print any time and easily add the dates on your own. 3-Ring Binder – You can find all sorts of colors and designs on Amazon here or at your local office supply store. Clear Sleeves – These keep your pages nice and neat. They’re optional, of course. You can find a large pack here . Plastic Dividers – These are great for keeping pages organized. You can find these here . Hole Punch – I like one that does all 3 holes at once. It makes my life much easier and saves a lot of time. There’s a huge variety of hole punches on Amazon or grab one at your local store. You can print these in color or black ink only. I know color ink can get expensive but they look so cute and pretty in color! Want one already made? We’ll create a custom student planner bound and ready for you! Click the link below to order yours today. After you have paid we will contact you within 24 hours to start your custom planner. Your planner will ship within 1-2 days of ordering. Shipping is included in price. Price for one custom student binder: $40! If you’d like to create your own binder you can select which ones you would like to print below. I’ve created an undated calendar for each month of the year. You can download all 12 months here. 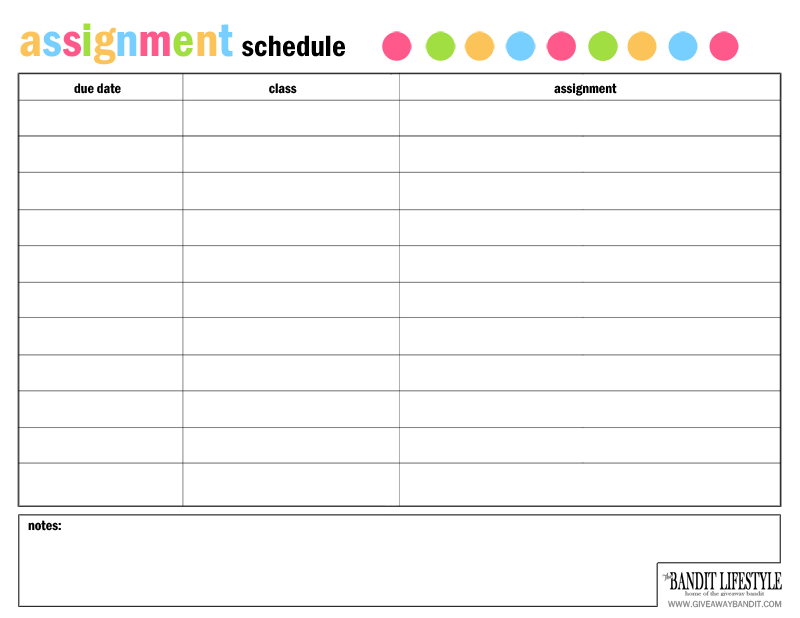 Keep your assignments organized and turned in on time. Stay organized with different classes. Print one of these for every day to keep track of your daily routines and activities. Keep track of all your exams in one place. Plan course assignments, activities and create a to-do list every week. Track the books you are reading down to the minute. Keep track of all those class projects in one place. Keep track of your grades by assignment. It’s always a great idea to have goals and keep track of them. It’s always a great idea to have plenty of extra space to jot down notes. How do you get organized for the school year? Comment below and share with us!